This attention-grabbing offset isn’t as far removed from Maybach’s Lester models as you might think… but can it bridge the gap between the big F and the big G? 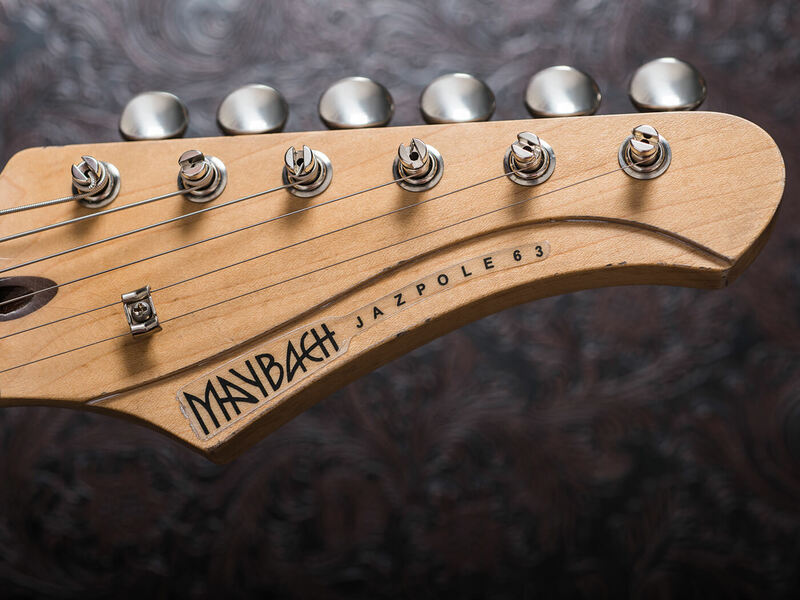 The Maybach JazPole 63 is a Jazzmaster-shaped guitar, but those expecting traditional offset performance should look elsewhere. Fender’s offset-bodied models are nothing if not divisive, but Maybach’s intention with this guitar seems to be the exact opposite. Like the Fano JM6, the JazPole strips things down and combines Fender and Gibson features in a way that should, in theory, appeal to a wide range of players. So we get that timeless, sweeping body shape with the bolt-on maple/rosewood neck and 25.5-inch scale length familiar to Tele and Strat fans, matched with a bridge/tailpiece combo and PAF-inspired humbuckers that could have been ripped right out of an old Les Paul. Maybach is perhaps best known for its interpretations of classic Gibson designs, with Eastern European manufacturing enabling it to offer high-end specs at prices that undercut the American boutique brigade. The JazPole is the only model in its range that really goes ‘off template’, so this is the first time we’ve had the opportunity to put this maker’s more leftfield design chops to the test. The basics, then. The body is made of poplar, an affordable alternative to alder that’s not renowned for being especially lively but sounds fine in plenty of Mexican-made Fenders. Finish-wise, it’s a light relic – at first glance, you’d guess it had done more than a handful of gigs, but not with Pete Townshend. 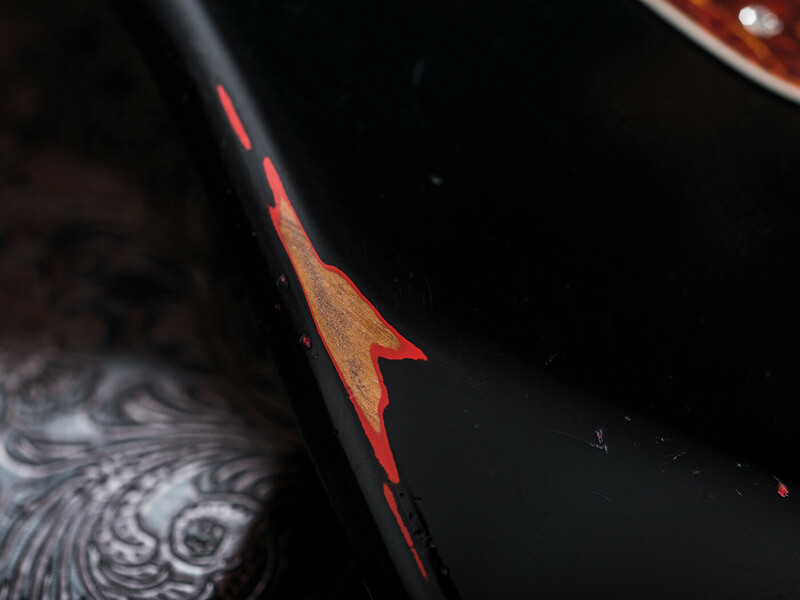 There’s some nice crazing on the paintwork and just a few tasteful dings revealing a coat of red below the black – yep, it’s a virtual refin. 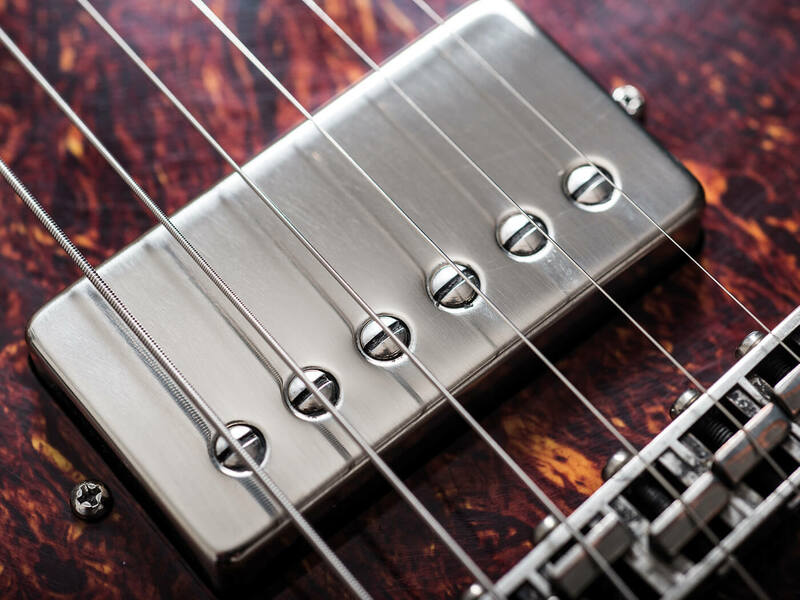 While the bridge and tailpiece are lightly tarnished, the pickup covers are rather less so. 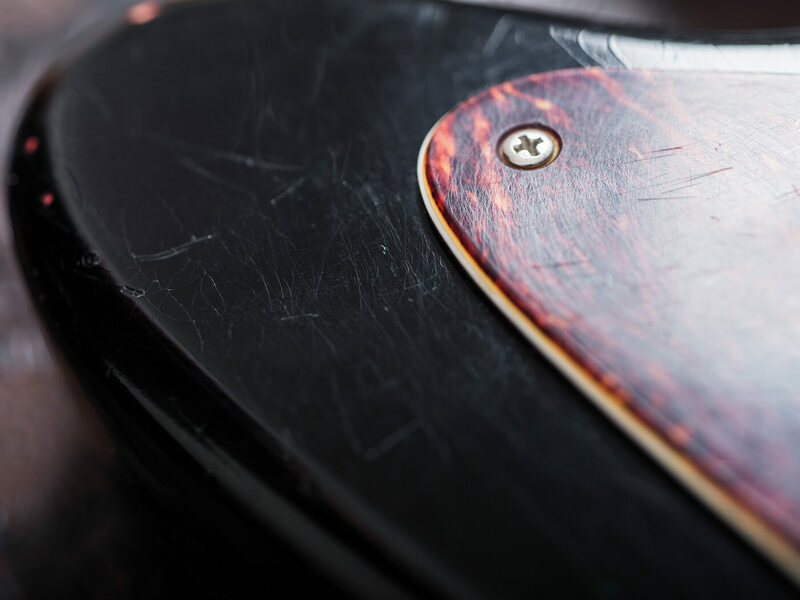 The satin-finished neck has been left pretty much ‘as new’, which is surely a good move – your left hand has work to do, and doesn’t need to be distracted by uneven finishes and fake cigarette burns. That neck is a reasonably hefty chunk, which – combined with the high-ish factory action on our review instrument – means this is not a guitar for the delicate of wrist. And there’s not a lot of room for lowering the bridge: with the height-adjustment screws turned down until they’re rubbing against the scratchplate, it’s only just low enough to save us from thinking about neck-pocket shims. Oh, and the screws shouldn’t really be rubbing against the scratchplate – they should pass through the holes for an extra millimetre or two of travel, only those holes aren’t quite aligned properly. Nitpicking, this may be… but would you thank us for leaving nits unpicked at this price point? Anyway, with the action lowered just a touch, it’s an agreeable player, with neatly dressed frets and a comfortable, well balanced feel on the strap. In fact, the only truly annoying thing about playing this guitar is the way its body shape keeps making us want to reach for the non-existent Jazzmaster vibrato arm, like trying to scratch a phantom limb. That’s not Maybach’s fault, though… and you can specify a Bigsby B5 for an extra £240. Speaking of options, the JazPole is also available with Gold Foil pickups or P-90s. These humbuckers should be pretty tasty. They’re made by Amber – the German maker behind Patrice Vigier’s favourite ’buckers – and these ‘Spirit of 59’ units are its most faithful recreation of the legendary PAF, using alnico IV magnets, scatterwound and unpotted. The first unplugged E chord reveals that this guitar has oodles of natural resonance, even if there isn’t a whole lot of zing to be wrung out of that poplar body. 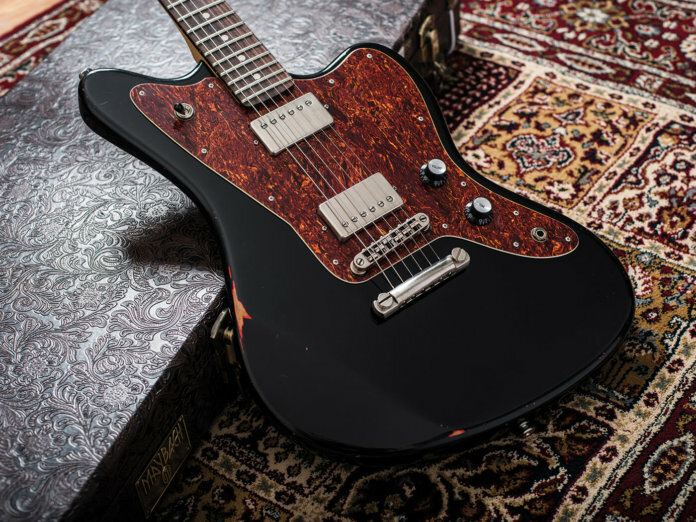 It certainly doesn’t have the percussive plunk of a Jazzmaster – and once we get amped up, it’s clear this guitar is an offset in shape only. With the neck pickup selected, there’s a piano-like clarity to clean notes on the wound strings, matched by a smooth sweetness on the skinny ones. It’s not the most characterful sound, but it proves that a well-executed Fender/Gibson mash-up can produce some seriously expansive tones. 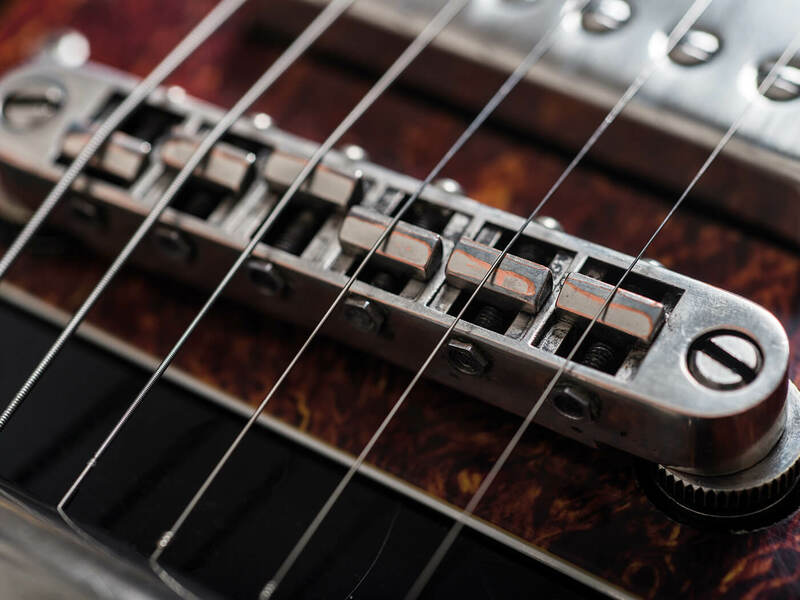 Switching to the middle position introduces an element of chime-y complexity, as you’d expect, but we’re not talking about the same degree of detail you get from a good Telecaster. Next to our reference Les Paul – with similarly PAF-ish pickups – the JazPole sounds less intimate and more strident. That remains the case with the bridge unit in isolation: it’s full and growly, rather than pert and spanky. All of this is very nice but, depending on your tastes, you might just be missing a bit of excitement. Maybe a dash of overdrive will put some colour into this thing’s cheeks? In fact it takes more than a dash – we quickly move from Tube Screamer to RAT in search of rewarding rock action – but the good stuff is definitely there. The RAT turns out to be a perfect partner for this rather treble-shy guitar, as it has enough top end for two: now the JazPole’s innate smoothness and solidity will keep your tone safely grounded, even up to the 15th fret and beyond, while the pedal’s crisp attack keeps you cutting through the mix. It’s still a less exhilarating ride than you might get from a Les Paul, an SG, or even a 25-inch-scale PRS; but if you’re playing super-tight rock riffs, as opposed to squalling wig-outs, then you might be glad of that. This is equally true in all three pickup positions, while the volume and tone pots are both well tapered, letting you calm things down just a touch between full-grimace sonic eruptions. What we have here is a high-class tool for delivering pure rocking tones with the emphasis on warmth and control. It’s just a pity there isn’t a little more treble content to play with – we’re drooling at the thought of this instrument with a zingy ash body and a clucky coil-split option. A classy all-rounder that excels at beefy overdriven tones.